Owing to our rich industry experience, we are offering a wide range of excellently designed Namibind Lamination Machines. The give range of lamination machine is manufactured at vendor’s end by using the high class material and sophisticated technology, as per with set industrial norms. 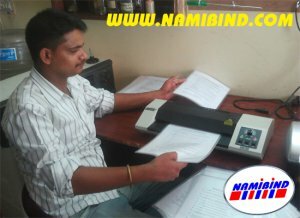 Offered lamination machine is tested on various stages by our quality controllers as per the set parameters of quality.